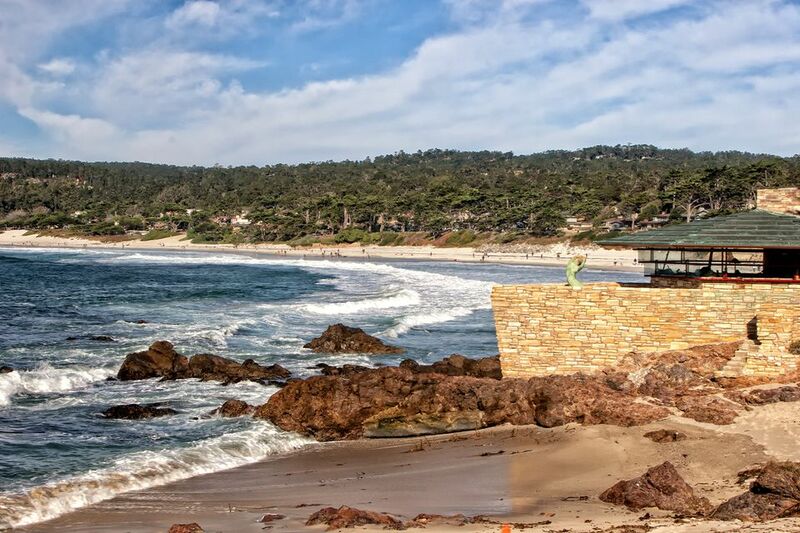 In 1948, Frank Lloyd Wright accepted a commission from Mrs. Clinton Walker of Pebble Beach to create a home on an oceanfront lot in the town of Carmel. She told Wright she wanted a house “as durable as the rocks and as transparent as the waves." In response, Wright created a house that is sometimes called "Cabin on the Rocks." It's a perfect example of Wright's principles of organic architecture, clad with local Carmel stone, a roof the color of the sea and the sky and a shape that some say resembles a ship. It's the only completed Frank Lloyd Wright house that overlooks an ocean environment. In the same year, Wright designed the V.C. Morris Gift Shop in San Francisco, another of his best California creations. The house is built in Wright's Usonian style. It's 1,200 square feet in a single story, with a triangular foundation. The floor plan is based on a hexagon, similar to the Hanna House in Palo Alto. The lines are low and horizontal. Original plans called for a cantilevered copper roof made of interlocking triangular panels, but material shortages during the Korean War made it impossible to obtain. Instead, it was covered with blue-green, baked-enamel shingles. When that roof started to leak, the family replaced it in 1956 with copper as originally intended. It was replaced again in the late 1990s. The casement window frames are painted in Wright's signature "Cherokee Red" color. Inside, every room has a view. The living room has a floor-to-ceiling fireplace, which bears the roof's weight and allows for almost-uninterrupted windows that look out onto the ocean. The dominant motif is triangular and even extends to the coffee table in the living room. The bedrooms are in the wings of the house, which join it at an angle. From above, it has an arrow shape. For privacy, Wright had the lot lowered by four feet, minimized windows on the sides of the house and planned a cypress hedge that runs to the street. By all accounts, Mrs. Walker was a woman with strong opinions. So was Mr. Wright. In fact, their correspondence fills a 5-inch-thick binder. The strong-willed Walker sometimes won out to Wright, getting her way in a squabble over whether to put a dishwasher or an exterior door in the kitchen. A master bedroom was added in 1956. In profile, the house resembles the prow of a ship that looks like it's growing out of the stone below. The reverse-stepped glass windows provide uninterrupted views of the coast and ocean. In the 1959 movie "A Summer Place," (which was set on the East Coast but filmed in California) characters Ken and Sylvia say Frank Lloyd Wright designed their beachfront house - and indeed he did. The film shows views of the Walker House's interior and of the exterior and from the patio. If you want to know more about Usonian architecture, read Frank Lloyd Wright's Usonian Houses by Carla Lind. The house is a private residence is still owned by Walker's family. You can see it from the street and from the beach below. It is also open to the public one day per year for a charity event. Mrs. Clinton Walker's House isn't the only Wright site outside California's metro areas. You'll also find several houses, a church, and a medical clinic in some of the most unexpected places. You can also see Wright Sites in Los Angeles and in the San Francisco area. The mysterious Tor House and adjacent Hawk Tower in Carmel are open to the public. Down the coast in Big Sur, Nepenthe restaurant was designed by Rowan Maiden, a student of Frank Lloyd Wright. The Post Ranch Inn includes structures completed by architect G. K. “Mickey” Muennig in 1992.